IMPACT, DESIGN, RESPECT FOR THE ENVIRONMENT Crosby Landscape is a year-round service partner for your outdoor living space. Whether refreshing established gardens, adding to existing plantings or starting from a blank page, we work hard to understand your style, environment and how you’ll enjoy your space. Crosby blends design, quality products and superior installation to create the best solution for your individual taste and needs. NEW HOME BUILDS Providing complete design and budget consultation service all while working with our clients to design the custom home of their dreams! From The Inside Out North Star helps make cleaning windows a breeze. Our tilt-in series of double hung windows are the perfect example. They can be cleaned safely and conveniently from inside your home. So easy youâ&#x20AC;&#x2122;ll almost look forward to cleaning them. Almost. WE DO INTERIOR RENOVATIONS AS WELL! MARCH and See us at THE WOMEN’S LIFESTYLE SHOW in SHOW DEN GAR THE LONDON SPRING HOME & VAN GOGH Y KATH t in APRIL – SPECIAL ATTRACTION mee day. each pm at the HOME SHOW – 2 to 4 vanGogh Furniture Paintology Products – Canadian Made and Owned " WORKSHOPS AVAILABLE " INVENTORY & ADVICE " ONE-OF-A-KIND painted furniture " 60+ colours of van Gogh fossil paint IN STOCK " Want to learn new techniques – ask about “Studio Time” "
a chef but also his passion for telling the stories behind the latest culinary trends. On page 47, he gives us the scoop on coconut oil. Lifestyle Magazine is one of London’s oldest and largest publications, so recognizing 15 years of providing our readers with information that they can use to build, renovate or style their homes has been a satisfying experience for our staff. Growing a local publication during economic ups and downs over the last decade and a half has been a real feat for our publisher Lana Breier and our sales team, and we are going to be recognizing Lifestyle Magazine’s achievements over the next year. We will be celebrating how far our publication, its advertisers, our story subjects and the city have come, through a series of follow up stories. We’ll look back at some of the renovations and builds covered in early issues and catch up with the folks who were profiled to see how they are enjoying their homes. Looking back is great but looking to the future keeps us moving ahead. We’re continuing to diversify the magazine’s content and bring you equally useful information about fashion, culture, food and travel in each issue. One facet of our year-long celebration is to offer enhanced features via Facebook. So be sure to “like” our Lifestyle Magazine page, and check there regularly to stay abreast of the latest from our list of talented writers and graphic designers. So swing into spring with a look at fun fashions for heading south or wearing here as the weather warms, on page 56; take a road trip to get a taste of spring on page 52 or hop into a brand new car and put it through its paces on page 29. We’re celebrating a new season, our 15 years of publishing success and our unique London lifestyle! Green is the colour of construction in the 21st century. TOP The Hotchkiss kitchen island features a barnboard base from a demolished Chatham barn with an eco-friendly concrete countertop. Concrete was also used for the perimeter counters. BOTTOM The vanity in the master ensuite bathroom also uses wood from the Chatham barn for its base and has a concrete counter. ABOVE The cosy living room has light wormy maple flooring, with distinctive streaks that were created by an infestation of ambrosia beetles. LEFT Interior doors on closets, and here on the master ensuite bathroom, are unfinished clear pine, sustainably harvested by Sparta’s EverWoods Mill. The ensuite also features concrete floors and an oversize glassed-in shower. ABOVE Cabinet and drawer handles in the kitchen, as well as the home’s curtain rods, have been fashioned from pieces of driftwood and branches that the Hotchkisses picked up on their property. ABOVE Much of the wood for doors and cabinetry came from EverWoods, a mill near Sparta that specializes in sustainably harvested Carolinian hardwoods. spring is the season of renewed interest in finding that perfect new house Whether itâ&#x20AC;&#x2122;s a larger space for a growing family or a maintenance-free condo for downsizing empty nesters, home seekers will find something that suits in this issueâ&#x20AC;&#x2122;s Model tour. here’s room to grow in Melchers Construction’s Model, in Mount Brydges’ new subdivision, Woods Edge subdivision. “I designed it with a young family in mind,” says Chris Melchers. At 2,400 square feet, the Midleton is spacious, with generous-sized rooms, he says. The main level includes a front den, off the foyer; a large mudroom and powder room, accessed from the double-car garage; and an open concept kitchen, dinette and great room across the back. The kitchen features Cambria engineered quartz on the island and perimeter counters, plus a corner pantry. The great room has a gas fireplace with built-in cabinets on either side. The dinette leads to a rear deck. This level has nine-foot ceilings and hardwood flooring throughout, except in the mudroom. The upper level has four bedrooms, including the master with an ensuite that includes two basins, a soaker tub and walk-in shower. The main bathroom is divided into two sections, a double vanity in one and the bath/shower and toilet in the other. A laundry room is also located on this level. The exterior of the home is a combination of Permacon stone and James Hardie fibre cement board, with timber details on the covered front porch. In Woods Edge – a Mount Brydges community featuring large executive lots in a natural setting. ❖ We are proud to offer a number of executive homes and floor plans from the high $300’s on estate sized lots in a park-like setting. ❖ Minutes from London and Strathroy, with easy access to the 402. ❖ Homes will be customized to suit your desires. Our team provides exceptional service from the initial design stage, through the building process and after sales service. he Riverwalk Model, in Sifton’s Westwood Village community, with its attached, single-storey condos in southwest London, is ideal for folks who love to entertain, says sales representative Barb Owens. The open-concept kitchen and great room flowing into a spacious dining area can accommodate large groups, from family gatherings to card parties. The kitchen, with a walkin, corner pantry, is separated from the dining area by an island. This model features engineered quartz countertops of solid taupe along the perimeter, which contrasts with the lighter veined surface, resembling granite, on the island. A wood deck, off the great room, showcases another option – an electronic awning that extends its full depth. “It’s like having a whole extra room outside in nice weather,” Owens says. The 1,633-square-foot brick home includes two bedrooms plus a den. The bedrooms are situated at opposite ends of the house, with the den adjacent to the master suite. Owens notes that this offers a range of options, such as opening up the space to create a roomy retreat. The master suite includes his-and-hers walk-in closets and an ensuite bathroom with glassed-in shower. A three-piece bathroom and main-floor laundry with access to the double-car garage complete this home. The Parkview Model is shown at right. Elevate Your Style You will rise above the standard in a Sifton home. Our superior new home features and finishes are the result of over 90 years of homebuilding experience. he Renaissance, Fusion Homes’ Model in London’s Sunningdale Green neighbourhood, offers a unique combination of entertaining spaces and comfortable family living, says marketing assistant Melinda Dewey-Gallimore. The two-storey, 3,250-square-foot home meets all needs, with its elegant accents and casual living areas, she says. The entrance foyer opens to a spacious living room and formal dining room with classic doric columns, and is separated from the kitchen by a butler’s pantry that’s perfect for formal entertaining. Yet the rear open-concept kitchen, breakfast area and great room offer a cozy, laid-back area for daily family activities. One of the unique features of the home, says DeweyGallimore, is the grand maple staircase from the foyer that splits into a double staircase at the upper level to create a second-floor catwalk. This hallway leads to an office and four bedrooms, each with an ensuite bathroom and walk-in closet. The master suite features a spa-like ensuite bathroom including two vanities with quartz counters, an oversized ceramic shower and free-standing soaker tub. A convenient second-storey laundry room is accessed from the master suite walk-in closet as well as from the main hallway. The home was awarded best architectural design in its size category by the Ontario Home Builders’ Association. he design of Hayhoe Homes’ Presentation Centre, in St. Thomas’s Orchard Park South neighbourhood, blends contemporary expression with functionality, says company partner Joe Hayhoe. The exterior natural architectural stone, complemented by pillars and arches, is a look that is growing in popularity, according to Hayhoe. It’s a clean and contemporary look that flows into the interior, he says. This is achieved with the open-concept layout and accents, such as the use of ceramic tile and hardwood flooring, in a palette of greys and warm, earthy browns, balanced by lighter wall tones and white kitchen cabinets, as well as the natural stacked-stone fireplace design. The floor plan has been designed with flexible use in mind, Hayhoe says. A front bedroom, accessed from the foyer, with its own bathroom and generous closet space, would be ideal for a home office or a young adult suite, he notes. The master retreat, with its walk-in closet and stylish ensuite bathroom, featuring a custom shower and freestanding soaker tub, is tucked away behind the kitchen, affording complete privacy. The finished basement, with an additional six inches of ceiling height built in, includes a family room, bedroom and three-piece bathroom, as well as abundant storage space. MEADOWS OF SUNNINGDALE This picturesque community of 56 one-floor units is taking shape at Sunningdale Road and Meadowlands Way, just west of Richmond Street. Stone and stucco exteriors plus flat roofs give these homes a European flair, Mescia says. As one-floor units, ranging from 2,300 to 2,400 square feet, they’re tailored to professionals, retirees and empty nesters, he says. Domus Developments offers home buyers ample choice However, a second-floor 700-square-foot loft, open to the main floor, adds additional space and could be a guest bedroom and den or a large studio. Ten of the lots will back onto a ravine and nature pond. Priced from $379,900, these homes will be available by spring. ground, rather than below ground, in a basement,” Mescia says. Surrounded by green space, with ponds and nature trails, the homes feature open-concept layouts with nine-foot ceilings and classic detailing such as granite counters and a gas fireplace. Exteriors incorporate clay brick and James Hardie fiber cement board, which Mescia says gives a more attractive appearance than traditional siding. These homes are priced from $309,900 and will be available for spring move-in. FROM TOP LEFT The two-storey foyer features beautiful cherry wood flooring and makes great use of available light through the high arched window. The airy yet comfortable great room is adjacent to an open concept kitchen. The formal dining room, with its beautiful crown moulding and lighting, has incredible elegance and character: perfect for playing host to important occasions or weekly gatherings. FROM LEFT The classic billiards room opens onto a terrace on the home’s north side, and also features a mini-wet bar. The library/den, with its built-in bookshelves and gas fireplace, makes a great place to curl up with some reading. Cherry wood cabinetry, granite counters and high-end appliances are hallmarks of the open-concept kitchen. The ensuite bathroom’s marble tile, glassed-in shower and Jacuzzi bathtub combine to create a study in classic elegance. A red-cedar, post-and-beam cathedral ceiling rises 32 feet above the surface of the kidney-shaped swimming pool in the milliondollar pool room. SHIRTS FOR CONNOISSEURS OF LIFE INSPIRED BY LIFE. Simplicity is the ultimate form of sophistication. The all-new Volvo XC90 is a sanctuary. A place to relax, think and connect with the world on your own terms. A place without clutter. Because clutter clouds the mind. It’s very Swedish to think like this. To be brave enough to remove rather than to add. It’s also very Swedish - and very Volvo - to start with a person who will use our products and ask, “How can we make your life easier?”. That’s what we’ve done with the XC90 - created a car that’s truly designed around you. cura’s flagship MDX luxury SUV continues to offer the same superior level of luxury comfort, quietness and technology features that earned numerous accolades when the totally redesigned iteration was introduced last year. Now, however, the MDX’s exhilarating dynamic performance, excellent fuel efficiency and advanced safety performance ratings are augmented by the addition of Acura’s legendary Super Handling All-Wheel Drive system as standard equipment. The roomy cabin, which comfortably accommodates seven passengers, features a reclining second-row bench that can slide fore and aft 150 millimetres. The One-Touch Walk-In feature moves the second-row seat out of the way at the push of a button for easy access to the third row. Three layers of acoustic glass in the windshield and front side windows, plus thick rear door glass, triple side-sill door seals and active noise control technology contribute to the impressive quietness in the cabin and reflect the overall refinement built into this vehicle. For 2015, power is supplied by a 3.5-litre, 24-valve i-VTEC direct-injected V-6 engine that features Variable Cylinder Management for enhanced fuel efficiency. This engine is paired with a standard six-speed automatic transmission with sequential sport shift paddle shifters and Grade Logic Control to enhance the driving experience. he completely redesigned XC90 is the first vehicle in a new era for Volvo, paving the way for a portfolio of new products. This premium-quality, seven-seat SUV has innovative safety features, dynamic new powertrain technologies that deliver impressive power and fuel efficiency, plus highquality exterior and interior designs that rival any competitor in the luxury SUV segment. The 2016 XC90 is an integral part of the global relaunching of the Volvo brand and the first to use the company’s new trim level strategy: Momentum, R-Design and Inscription. The Momentum trim level offers visually appealing interior and exterior design, with available options separate from the R-Design and Inscription-specific features. The R-Design trim level features a sporty, dynamic look, while Inscription, the highest trim level, offers a level of luxury and craftsmanship that reflects elegance and exclusivity. The XC90 is currently available with the T6 and T8 PHEV engine variants, both offered in all-wheel drive. Both are equipped with a 2.0-litre fourcylinder that’s supercharged and turbocharged. These engines deliver their output through an eight-speed automatic transmission. The T8 PHEV also has an electric motor integrated into the powertrain that delivers an additional 80 horsepower. The PHEV system is expected to deliver an impressive combined fuel consumption of approximately 2.7L/100km. he stunningly beautiful Jaguar F-Type sports car gains new powertrain and driveline upgrades for 2016, including the availability of a six-speed manual gearbox on rear-wheel drive V6 models, available intuitive allwheel drive and an awesome F-Type R version that boasts 550 horses under its sleek hood. The new F-Type R, available in both coupe and convertible configurations, includes standard all-wheel drive, enabling it to launch to 100 km/h in just 4.1 seconds. Its top speed is electronically limited to 300 km/h. For 2016, all F-Types will be fitted with electric power assisted steering – a first for Jaguar sports cars. This refined system delivers the feel and response sports car drivers expect, while providing power assistance only when required, reducing fuel consumption. For enthusiasts who prefer shifting on their own, the new six-speed manual transmission features a short-throw gear lever with a travel of just 45 millimetres, gear ratios that are closely spaced and pedals positioned to facilitate heel-and-toe changes. Inside the cabin, the instrument cluster has a new look, and the infotainment system has been upgraded to a premium 770-watt Meridian surround sound audio system. Additional new standard equipment includes Jaguar’s Smart Key keyless entry system, 14-way power-adjustable seats and a panoramic glass roof on Coupe models. THE F-TYPE COUPE. Everybody knew their proper place in the sports car food chain. Then we went and created this: the new F-TYPE Coupe. Crafted in lightweight aluminum for stunning responsiveness, and stirring things up with 550 supercharged horses in “R” trim. In fact, it even overpowers Porsche 911 Carrera S and Audi R8 4.2 with plenty to spare. Status quo be damned. This changes everything. Starting from $72,900. he Q3 is the new entry point to Audi’s lineup of luxury sport utility vehicles, though this compact crossover has styling that makes it look more like a sporty hatchback. Its svelte, stylish design makes the Q3 an ideal fit with young, urban consumers, while its upscale materials, fit and finish reflect the luxury, quality and comfort that are signatures of the Audi brand. The Q3 is available in either frontwheel drive or Audi’s renowned quattro (all-wheel drive) system. Both versions are powered by a 2.0-litre, 16-valve, directinjected, turbocharged four-cylinder producing 200 horsepower and an impressive amount of torque – 207 lb.-ft. that kicks in at just 1,500 revs. This remarkably smooth engine is coupled to a six-speed Tiptronic transmission with Dynamic Shift Program that ensures crisp gear changes. The Q3 delivers a firm but very comfortable ride with MacPherson struts up front and a four-link rear suspension. This layout results in smoothness and stability on the highway with minimal body roll while cornering. The Q3 features a precise steering system with speed-sensitive electromechanical power assist, while the braking system, with its ventilated front discs and solid rear rotors, brings the vehicle to a halt with confidence. With an iconic design that is smooth and continuous, 2015 Camry appears as if it’s crafted from a single sheet of metal. With its forward stance and aggressive grille, Camry has curb appeal and then some. The Arteviaâ&#x201E;˘ ACC ,or the Architectural Concrete Collection, is composed of 28 new products designed for your concrete driveways, patios, pool decks and walkways. MINIMIZE your riskâ&#x20AC;¦MAXIMIZE your retirement savings!! RIGHT & BELOW Kathy Van Gogh, of Fossil Paint chalk paints, and CityLine’s go-to DIYer Nicholas Rosaci will be on hand to demonstrate. Attendees can also take in beautiful displays of indoor and outdoor furniture and products. enthusiastic gardener and the intrepid renovator. This year is no different, with two well-known home décor celebrities on stage. Kathy Van Gogh, who developed Fossil Paint, Canada’s best-selling chalk paint, and is reportedly a distant relative of Vincent, will be featured on the Ideas Stage daily, talking about chalk paint and painting techniques. She will also be meeting, greeting and demoing at Booth 545, courtesy of the folks at Stan Portley’s. “She’s very hands-on and is always working with something when she’s meeting the public,” says John Robinson, owner of Stan Portley’s. Held from April 10 to 12 this year, the show always has plenty to interest the eager DIYer, the enthusiastic gardener and the intrepid renovator. Drop by our NEW showroo m! For nearly 40 years, the London Spring Home and Garden Show has been bringing fresh ideas for everything inside, outside and all around the home. Duo Building will feature this sophisticatedly retro table, reclaimed from an old bowling alley lane. Serving Elgin County for Over 22 Years! OPPOSITE PAGE FAR LEFT The famous Water Tower Place is one of the Michigan Avenue’s Magnificent Mile landmarks. MIDDLE LEFT Navy Pier provides fun for travelers in the spring, summer and fall. LOWER LEFT Chicago’s many sky scrapers, like the Willis Tower (previously named the Sears Tower) and the John Hancock Tower, provide panoramic views of this beautiful city. Photographs courtesy of Choose Chicago. TOP LEFT The Robie House, located in the Chicago suburb of Oak Park, is the finest example of Frank Lloyd Wright’s prairie style architecture. Photograph courtesy of Frank Lloyd Trust; Photograph by Tim Long. THIS PAGE RIGHT Chicago’s downtown bars and restaurants are busy, vibrant places to enjoy live music, like Brushville, playing at Bub City. Photograph by Jill Ellis-Worthington. Aquarium and Soldier Field (home of the NFL’s Bears) when staying indoors is preferable. WHERE QUALITY & FRESHNESS IS SECOND TO NONE! Produce ▪ Dairy ▪ Fresh Meats Bulk Foods ▪ Bird Seed & Pet Food Garden Centre & so much more! 1030 Talbot St., St. Thomas, ON 519-633-9691 www.briwoodfarmmarket.com OPEN MON. TO SAT. 8 A.M. TO 8 P.M., SUNDAY 8 A.M. TO 6 P.M.
he Carolinian Cabinet Company’s official motto is: “If you can dream it, we can build it.” It is a claim taken very seriously by the Grand Bend firm’s sole proprietor, Jason Henderson. “Customers often have an idea of what they want but cannot picture it. By simply explaining their goal or how they want to use the space, we can provide solutions,” says Henderson, himself a cabinet maker. “Sometimes we’ve had to create accessories of our own to accomplish our client’s dream. We don’t stop until we’ve come up with a solution, and so far, so good.” Established in 2009, the company serves a large geographic area from Grand Bend, Lambton Shores to Huron County to Petrolia and more recently extending out into Oakville, although Henderson says there is “no limit to where we will go.” Operating out of a “one-stop shop” facility, the company specializes in residential cabinets for kitchens, bathrooms, bars, closets, wall units and fireplace surrounds. “We believe that having the showroom connected to the shop is more beneficial to the customer experience. This way our client is able to see how their cabinets are made, touch finishes, and get more technical feedback,” says Henderson. “Our recently renovated showroom provides the customer with plenty of door style options and finishes to choose from, along with countertops, accessories and hardware. Here the customer is able to test samples of accessories we have to offer for a more hands-on approach.” The company employs a design consultant, Alannah Fanset, who, with Henderson, helps customers with the “whole picture,” advising them on flooring, backsplash, paint and accessories. “Whether it’s the design of your kitchen or bathroom layout, or simply selecting paint colours, we do it all,” says Henderson. n a recent visit to Guyana, located on the northeast shores of South America, our driver, Arnie, pulled to the side of the road and proudly presented me with fresh coconut water – straight from the coconut. The unmistakable aroma of coconut filled my nostrils as I drank the cold, refreshing nectar in sweltering 40°C heat. This, after all, was the reason for my visit: a 750-acre coconut plantation on the Atlantic. Knowing the controversial nature of the health benefits of coconut oil, I was keen to understand the route from palm to table. The use of fats like coconut oil were quickly squelched by aggressive ad campaigns in the ’70s by manufacturers of corn oil and related products (and we all know the monster that corn-based products have become). Coconut oil has been shown to be a heart-healthy food that offers many benefits. Cold-pressed extra virgin coconut oil can help our bodies mount resistance to viruses and bacteria, and the lauric acid it contains increases the good cholesterol in the blood. After our first night in Guyana, my wife Cynthia and I were up at dawn, used a garden hose to shower from rainwater collected in a cistern, enjoyed a simple breakfast of fresh fruit and were off. Through the gates of the farm at the roadside, we could see majestic palms waving in the wind as far as the eye could see. There were a few small rustic barn-like structures on the property, but our attention was directed to one structure where a group of Guyanese women were working methodically to process the coconuts collected that morning. I sat for hours coming to understand harvesting, grading and processing. Cold-pressed extra virgin coconut oil can help our bodies mount resistance to viruses and bacteria, and the lauric acid it contains increases the good cholesterol in the blood. After the fallen fruits are collected, the coconuts are cracked open and placed in the sun to dry, resulting in ‘copra.’ The flesh shrinks slightly from the shell, making extraction easier. During cold pressing, the oil from the copra is pressed at temperatures not exceeding 120°F, preserving its health benefits, flavour and texture. Most importantly, the oil is not refined, processed or deodorized. It is not unlike the Mediterranean diet, which relies heavily on extra virgin olive oil. After many studies, we now understand its clear health benefits. Olive oil is a staple in almost every kitchen today and is used for vinaigrettes, sautéing, roasting or consumed in its best form: raw with a splash of balsamic, with bread for dipping. The same can now be said of coconut oil: substitute for vegetable oil in a coffee cake for a subtle increase in aroma; use on the skillet when preparing hotcakes; add a couple tablespoons in a breakfast smoothie for richness. Consumed in small amounts as part of a regular diet, it can positively affect our hormones for thyroid and blood sugar control and provide antioxidant activity in the body. The benefits on the outside are as evident as inside when used on skin and hair as a moisturizer and conditioner. It’s time to reconsider coconut oil. 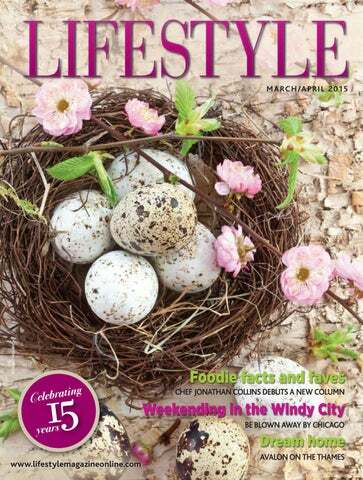 Check out LIFESTYLE MAGAZINE on Facebook for more of Chef Collins’ photos, journal and recipes. An artist’s rendering of what the Port Stanley Festival Theatre will look like when the renovations are completed in 2016.
environment for actors and staff, increasing the auditorium capacity from 150 to 200 or 210, and adding to the cultural experience for visitors and residents through a wider range of theatrical performances. Changes include: improvements to the stage; new dressing rooms and washroom facilities; the addition of a multi-purpose room for youth theatre, rehearsals and public receptions; improvements to the workshop to provide a more efficient and safer place for theatre production staff to create sets; and the addition of office and retail space. This type of renovation and expansion does not come cheap; it has a budget of $2 million, says Kempf. “We reached out to all levels of government, foundations, corporations, small business owners and our patrons for support. The response has been outstanding!” she says. “We have just reached our three-quarter mark with the commitment of $1.64 million in pledges.” With 59 out of 123 performances sold out in 2014, theatre staff decided to add a week of shows, extending the 2015 Season from May 27 until September 19. SPRING FORWARD all watches 15% off for the month of March. Don’t forget! DST is March 8th. “We wanted to give our patrons an increased opportunity to experience Port Stanley Festival Theatre and encourage the economic growth of our community through an extended season of tourism, travel, and leisure,” says PSFT’s artistic director, Simon Joynes. The 2015 Season playbill can be viewed on the Port Stanley Festival Theatre website. Donations of all sizes to the Expand the Experience campaign are still welcome, and Kempf and Joynes invite readers to visit www.playbythelake.ca or call the administrative office at 519782-3914 to plan how they would like to play a part. DOT BOWL This colourful, funky bowl, measuring 8 inches by 4 inches, makes eating fun. SPLASH VASE Some of Cornelis’ production work consists of manipulating glass to appear suspended in time. RAINING FIRE Is currently on exhibit at Corner Glass Gallery in St. Thomas. Combining glass with silver, this piece measures apporoximately 21 inches in diameter. HERE HONEY LET’S EAT This piece was exhibited in the Anger Show in Calgary and has been sold. It is a 12-inch plate made with love and hate, which, according to Cornelis, are two closely related emotions. FIRED UP! Glass Arts RAVEN SHADE Sold to a private collector, this piece combines fusing and firing. The process enables Cornelis to achieve different looks whether or not the shade is lit. CANADIAN FINE ART AND FRAMING 519-434-7112 430A Richmond St.
Come see our new bath and body area! New arrivals daily. Fri., April 17, 7 to 9:30 p.m. Sat., April 18, 10 a.m. to 5 p.m. Sun., April 19, noon to 5 p.m.
Swans to see, fresh syrup to taste in Lambton County swan up close. Activity stations are available for children. Visitors can also take in the annual Paint Ontario Art Competition and Sale in the Lambton Gallery at the museum. Outstanding artists from all across Ontario take part in this juried competition that celebrates the natural beauty of the province. The running of maple syrup is certainly another tasty sign of spring, and visitors can take in the 19th annual Ipperwash Maple Syrup Festival at nearby Williamson Farms. Williamson Farms will be offering wagon rides into the sugar bush. The Kiwanis Club will be offering a daily pancake and sausage breakfast at the Thomas Hall in the Legacy Recreation Centre in Thedford during the event, which runs from 8 a.m. to 2 p.m.
We know the secret to keeping up with the Jones... The Jones have been keeping up with Jennings since 1885. Shop where the Jones shop! OPPOSITE PAGE Yellow, blush pink, vibrant floral prints and a smattering of stripes. Fashions shown are Inspired Style by Spanner. RIGHT A key item – the casual maxi skirt in ice blue. FAR RIGHT Pack a colourful, patterend scarf that works double duty as a stylish head wrap or to warm the shoulders on a cool night. Both from Sandwich. • FRESH COLOURS • KEY ITEMS SNAP UP FIGUREFLATTERING SEPARATES SUCH AS CAPRIS, MAXI SKIRTS AND AN ASSORTMENT OF STREAMLINED, BODY-SKIMMING TUNICS, KNIT TOPS AND SCARVES. LEFT From Sandwich: a waist-length jacket with clean-cut lines layers well with floral tees and when paired with ankle pants or long skirts. Add a colourful scarf to complete the ensemble. BELOW Ronen Chen’s flowing tunic dress works doubleduty and can be worn as a cover-up or out to dinner on warm evenings. Spring has sprung! SPRING 2015 now available! Wednesday, April 15, 2015 7:30 am to 9:00 am BEST WESTERN PLUS Lamplighter Inn & Conference Centre $65 per person or $520 for a table of 8. Parking is included. What’s in a name? Plenty, if it underlies your entire business philosophy, as is the case with London’s recently rebranded women’s apparel shop Hangar9, formerly Fisher and Company. Hangar9 began life as Fisher and Cooper, a partnership between Pat Cooper and Jo-Ann Fisher in 1983. Fisher struck out on her own, opening Fisher and Company in 1988. After a successful move to its present Richmond Row location, the company adopted its Formula for Wardrobe Success – [F+C] + 9 = 36 – in 1994. Simply put, the formula states that with the right nine wardrobe items, Fisher and Company stylists can help customers create a wardrobe of 36 different looks. The formula provided the inspiration for the company’s new name – Hangar9, introduced in the fall of 2014 with a new, completely redesigned website. While the name may be new, the Fisher family’s long-standing commitment to redefining fashion with extraordinary brand-name clothing and high-end service by delivering a truly personal experience to its clientele remains rock-solid. “Hangar9 exists for the modern woman. We exist for you,” says Fisher. This assertion is certainly upheld by the personalized services offered by Hangar9’s flagship London store and Toronto location (opened in 2007). Leading on the fashion front (l-r): Jo-Ann Fisher, Denise MacDonald, Lisa Ferguson, Jodi Neichenbauer and Rachael Fisher. Pick up a free copy today! n the middle of February, statistically the saddest time of the year, Pauline Halstead found herself having the time of her life. INSET Pauline Halstead before. ABOVE Halstead at Michael’s on the Thames, wearing her new clothes from Hangar9, sporting a new hairdo by Lisa Sallabank and a fresh makeup look by Cindy Dawson, both from Salon Entrenous. OPPOSITE PAGE An easy-going hairstyle that respects her natural hair colour is perfect for Halstead’s busy life as an entrepreneur who loves the outdoors. ABOVE An easy-to-do makeup regimen was designed for Halstead, minimizing the natural red tones in her skin and playing up her lovely eyes.